The painting then falls out of the frame. Not good. 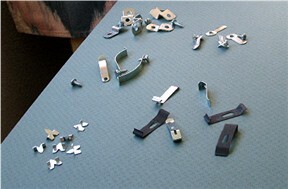 Below are some examples of different kind of hardware that can be purchased from frame suppliers to hold paintings in wood frames. 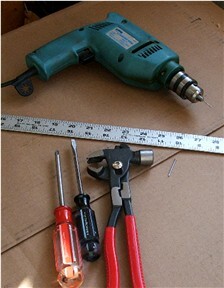 These all can be installed with basic tools–screwdrivers, hammer and a small nail or a drill with a small bit. 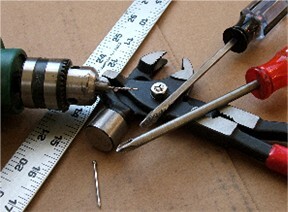 Other tools needed are a ruler, pencil, and it helps to have a candle or other form of wax to lubricate the screws. 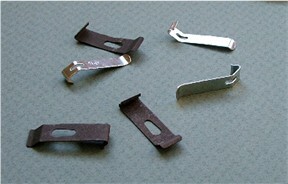 OFFSETS Offsets come in a variety of sizes from 1/8″ to 1/2″. The size you need depends on the thickness of your canvas, or painting support. Offsets are screwed into the frame. 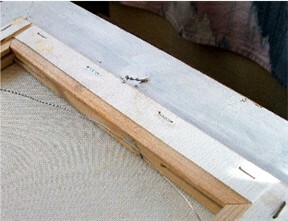 To best keep the canvas or support from warping in years to come, use at least 2 offsets per side. Drill a little bit of a hole to start the screw, being careful not to go through your frame. 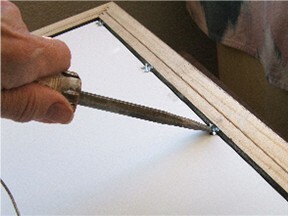 Or tap a small nail just an 1/8″ into the frame and remove the nail. 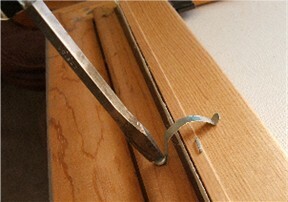 Rub the screw on a candle to make it easier to screw into the wood. Use the appropriate screwdriver to tighten the offset so the painting won’t wiggle. TURNBUTTONS are used when the back of the canvas or painting is flush with the frame. See instructions for offsets on drilling holes. PUSH POINTS can be installed with a sturdy screwdriver, but care must be taken not to put your other hand in harm’s way. 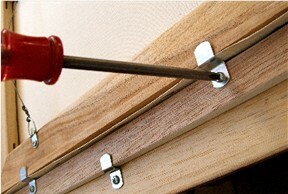 Push points are also called glaziers points. If your frame is made of soft wood, these are the easiest things to use. 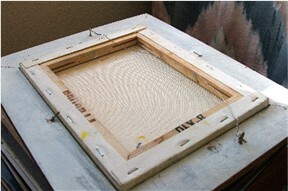 However, if your canvas is thicker than the rabbet of the frame, you can’t use push points. 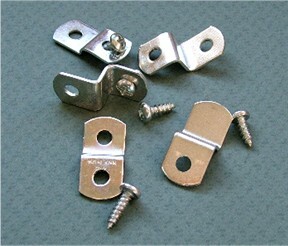 There are flexible wood framing clips that can be screwed into the frame, providing a secure fastener for your painting. 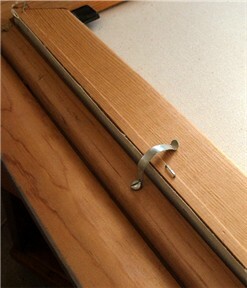 Here is a screw-in clip installed on a frame. 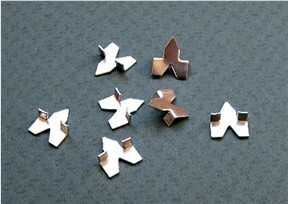 They are especially good for odd thicknesses of canvases. 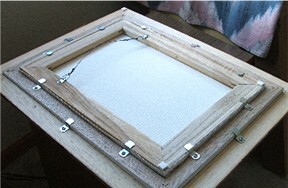 After installing the painting in the frame, a wire must be attached to the back. 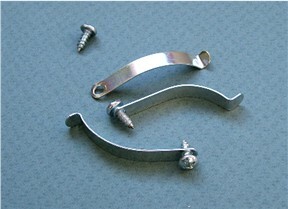 Part 2 will address ways to do this–different kinds of hangers and the wire. 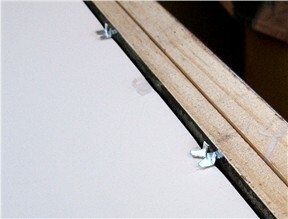 Be sure to measure 1/3 of the way down from the top of your frame for placement of the hangers. 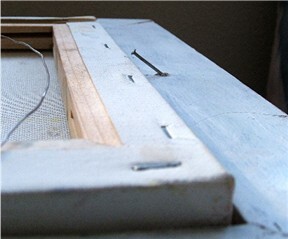 When you hang up the painting the wire should be 2″ – 3″ from the top edge of the frame.